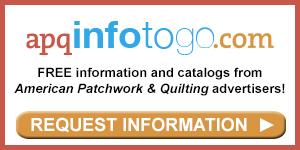 See the featured quilts and web-exclusive color options and projects from the American Patchwork & Quilting August 2015 issue. 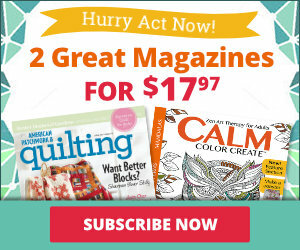 The August 2015 issue of American Patchwork & Quilting is on sale from June 2--August 4. For the mother-daughter design team of Bonnie and Camille, quilting is a family af fair that spans generations. 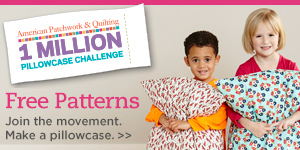 See more pictures from their homes and sewing studios here. 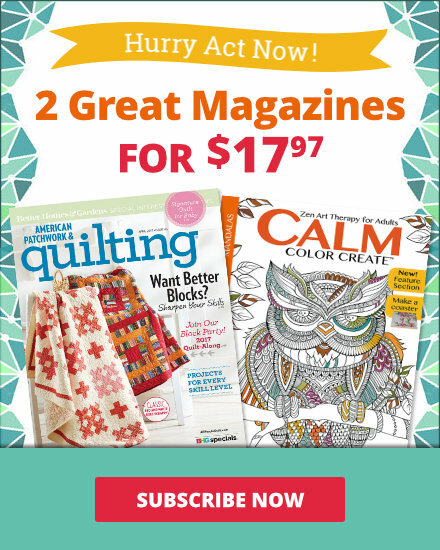 Pick out your favorite purple and burgundy prints and utilize a trio of techniques—stitch and flip, strip piecing, and hand appliqué—to construct a star and flower quilt. Memories of seagrass baskets and gentle beach days in South Carolina’s Low Country beget this wall hanging’s woven look. Rather than setting in seams, the designer used partial seams to create the illusion. Quilt tester Laura Boehnke transported her same-size version of By the Sea from the seashore to a nighttime garden. Amping up the contrast between the strip sets and the background changed the look from that of a woven basket to a wood-frame trellis. Light glinting off the metallic highlights in the Asian-inspired fabrics enhances the three-dimensional effect of the piecing. Carefully chosen solids create the illusion of overlapping pieces. Quilt tester Laura Boehnke used a rainbow of mottled fabrics in her color wheel-inspired version of Color Cubes. A black background contains the design within each block. While the painterly fabrics result in a less crisp look than if solids were used, Laura’s project is a gorgeous example of what else you can do with this design and still maintain the transparency. The strong X design in the Endless Squares block is graphic whether big—as in the featured antique throw—or small—as in the newly designed table topper. For a fresh take on the classic Endless Squares block, use whimsical floral fabrics in pink and mint, and frame the quilt center with a large-scale floral. Designer Jean Wells teaches you how to expand your piecing horizons with a technique she calls slice-and-dice piecing, plus offers tips for playing with color! An antique block in feed sack-inspired fabrics looks fresh and fun on a crisp white background. Sweet prints with country flair make up quilt tester Laura Boehnke’s version of Modern Vintage. The wall hanging is a study in contrast, with some blocks having distinctive differences between the light and dark areas and others having only subtle differences. Laura added 1"- and 4"-wide finished borders to frame her vintage-looking blocks. The sky is the limit on a hand-appliquéd version of a Tree of Life quilt. Its flora and fauna have shapes, sizes, and colors limited only by the imagination. See detail pictures of the applique and embroidery here. Exuberant pinwheels catapult across a throw that appears to be scattered with confetti. 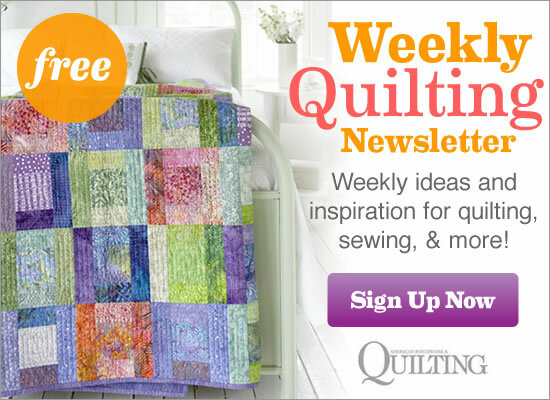 Warm up to a quilt made with cozy flannels and featuring bright pinwheels blowing across the center. The black in the border tones down the bright squares. For an easily changeable display, mount a short curtain rod on your wall and use clips to hang mini quilts.